The site of City Hall on Cork Hill was originally the site of Sainte Marie del Dame which came into the possession of Richard Boyle 1st Earl of Cork who built his home on the site Cork House around 1600. 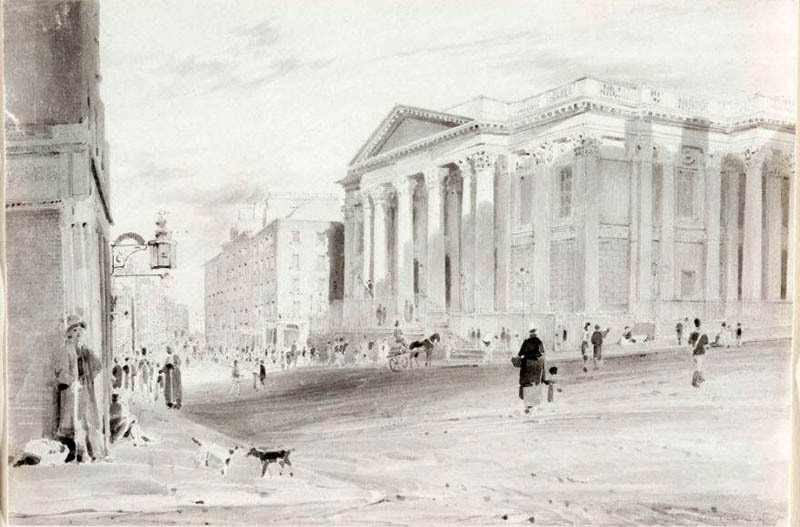 Cork Hill derived its name from the house and Dame Street was named after the demolished church. After his death the house was used for government offices and other purposes until it was acquired by the city for a Royal Exchange. At one stage it was proposed to construct a square on the site to be known as Bedford Square. The site cost £13,500 and £40,000 for the building which was raised through lotteries. 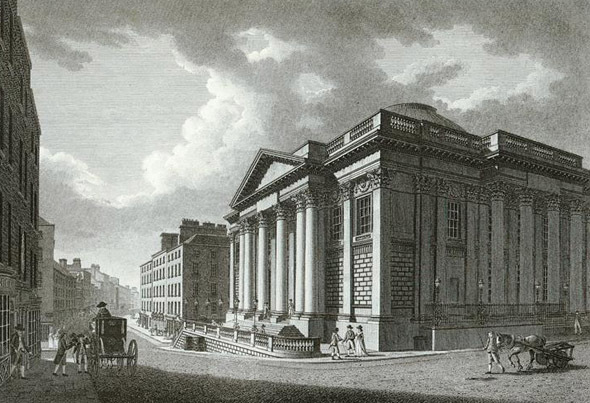 In 1768 architects were invited to enter designs for the building, sixty-one designs in all were received and these were exhibited in William Street Exhibition Room. After consideration, the first prize was awarded to Thomas Cooley – a young architect new to Dublin. He did not live long enough to build on this success or indeed see his building finished as he died fifteen years later in 1784. 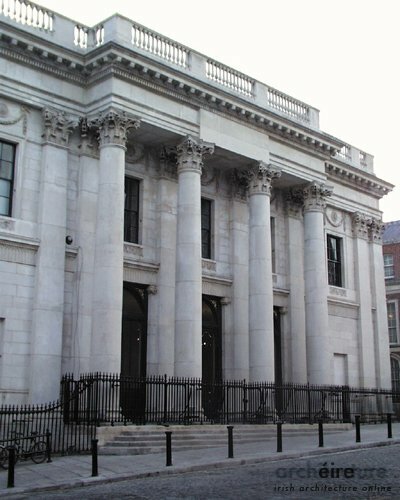 James Gandon was second with a design that many thought was superior to Cooley’s. 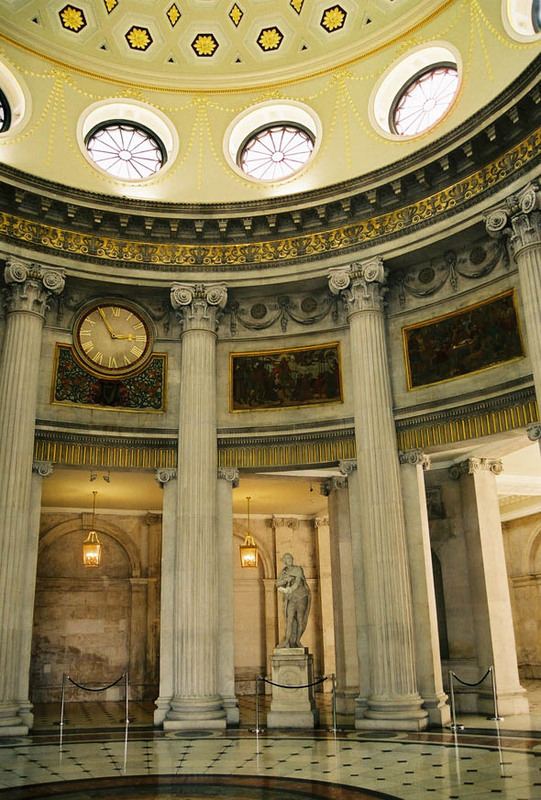 However Gandon was to have his revenge – when Cooley died, he was the architect for the Four Courts – a project that was taken over and changed by Gandon. The only part of Cooley’s design completed was amalgamated into Gandon’s complex as the western block. 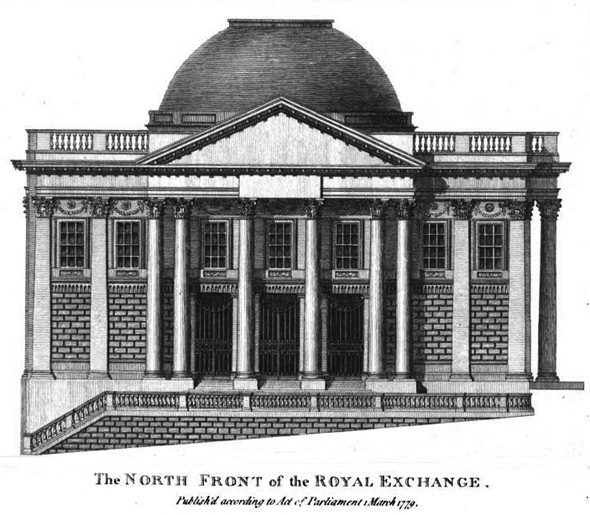 The new Exchange building was started promptly after the competition and completed in 1779. In 1852 it was acquired by the City Corporation and is now the meeting place of the city aldermen. Changes were made internally with screen walls being added to the large entrance hall forming the rotunda for the first time. These were removed during the restoration early in 2000. The building dominates and terminates the Parliament-Capel Street vista with its giant portico and copper dome. The building is set on a slope and is placed on a rusticated pedestal and balustrade. The two main facades – the north and west are similar while the eastern facade which faced onto a narrow lane received a plainer treatment. With the demolition of buildings on Dame Street in the 20th century, this facade is now visible across a small park that the corporation built on the derelict sites. The pedimented facades have a giant order of corinthian columns with three openings between them. Originally these doorways opened into the interior ground floor which was all one space before subdivision in the 19th century. 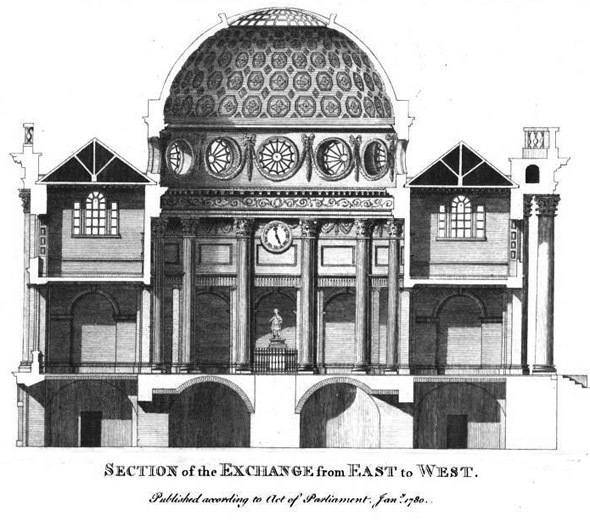 The placing of the external columns and pilasters expresses the positioning of the internal columns which support the great dome and subdivided the original space. 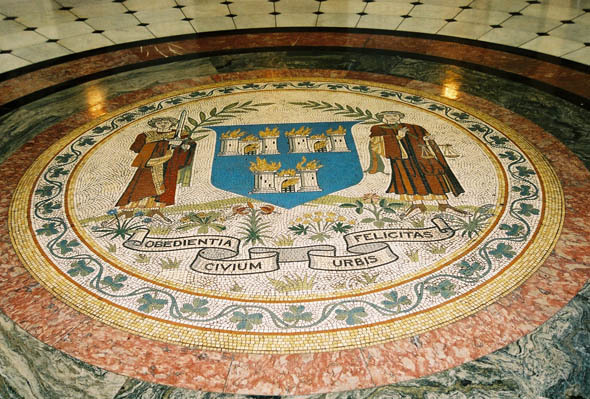 Internally the building is dominated by the massive entrance rotunda with its elaborate City Corporation seal set into the floor mosaic. The motto of the corporation is the authoritarian ‘Obedientia Civium Urbis Felicitas’ which is roughly translated as ‘Happy the city where citizens obey.’ This is a later addition from when the Corporation took over the building. Originally the entire ground floor was one space divided only by the columns that support the dome but was subdivided to form office accomodation in the 19th century. 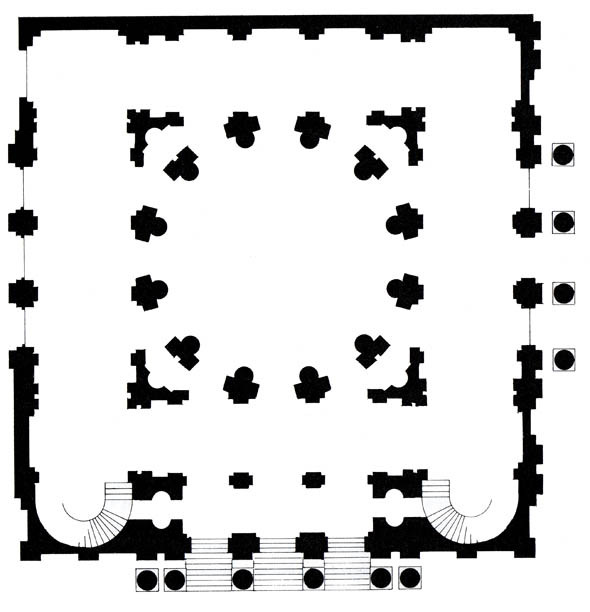 A contemporary report describes it: The dome is spacious, lofty and noble, and is supported by twelve composite fluted columns, which, rising from the floor, form a circular walk in the centre of the ambulatory; the entablature over the columns is enriched in the most splendid manner, and above that are twelve elegant circular windows. 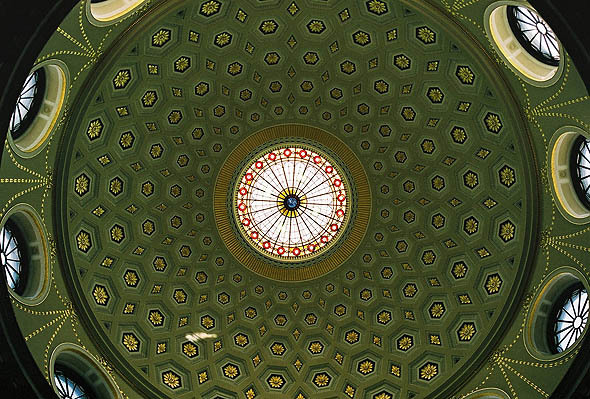 The ceiling of the dome is decorated with stucco ornaments in the mosaic taste, divided into small hexagonal compartments and in the centre is a large window which lights most of the building.